Demand for artificial intelligence and machine learning specialists in the country are expected to see a 60 per cent rise by 2018 due to increasing adoption of automation. Although AI and machine adoption is on the rise in India, there is negligible talent with experience in technologies like deep learning and neutral networks. As there is significant talent crunch in the AI space and AI roles are evolving into broader and more strategic productivity management roles, the demand for AI experts will only increase in the future in India. 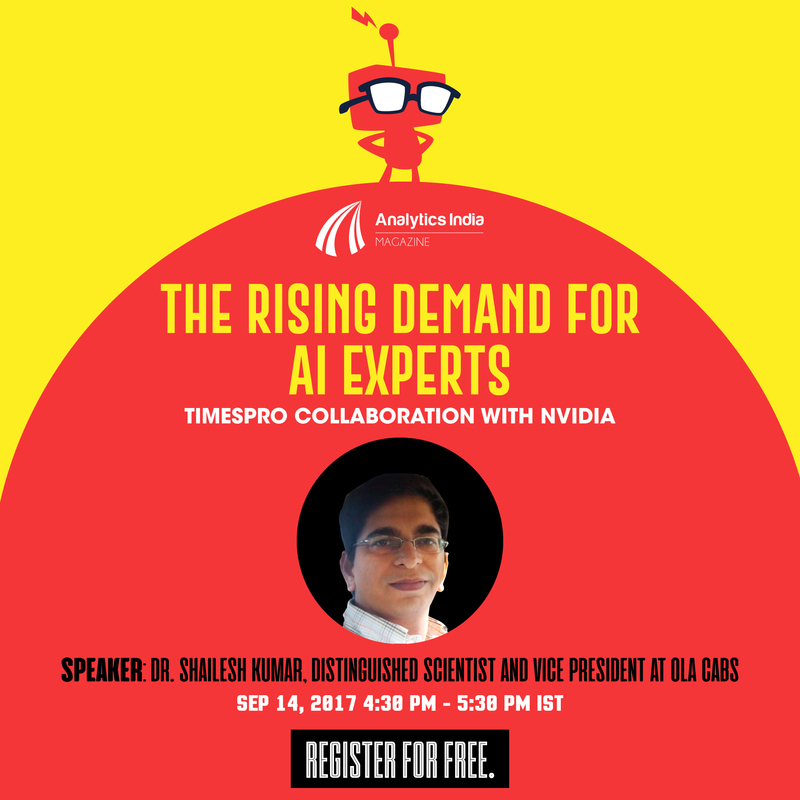 Chief Scientist and Co-Founder, ThirdLeap – an AI EdTech company. Machine Learning Researcher at Google, Bing, Yahoo!, and Fair Isaac. A TEDx speaker, Dr. Kumar has been an invited and keynote speaker at a number of public and corporate data science events including the Fifth Elephant, Data Science Congress, and NASSCOM Big Data & Analytics Summit. He serves as a Data Science advisor to a number of Startups, Tech companies, VC’s, and government agencies. Dr. Kumar was recognised as one of the top ten data scientists in India in 2015 by the Analytics India Magazine. He holds twenty patents and has published twenty international publications and book chapters in these areas. Dr. Kumar received his PhD in Electrical and Computer Engineering and Masters in Computer Science, both from the University of Texas at Austin, USA. He received his B-Tech. in Computer Science and Engineering from the Institute of Technology.